These efforts are not limited to “Stand-Your-Ground,” however, but rather are broadly applied to generally constrain the scope of conduct that qualifies as lawful self-defense, and thus deemed free of criminal liability. 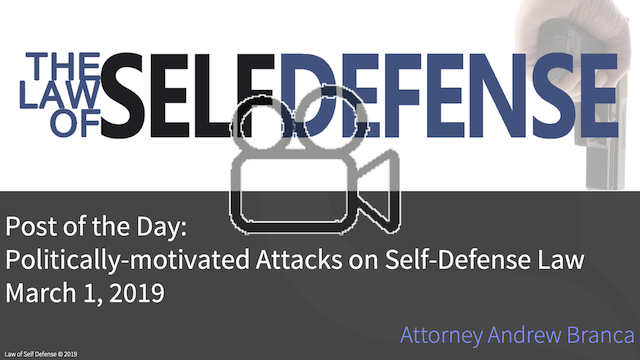 Keep in mind, when the scope of self-defense is narrowed, that means many cases that would currently result in acquittals as acts of lawful self-defense will instead result in convictions and sentences of decades and even life in prison. It’s a big deal. It is ironic that even as the racial grievance industrial complex seeks to narrow the scope of what qualifies as self-defense, it is black citizens who are disproportionately the targets of violent crime,. It is thus black citizens who are disproportionately faced with the need to act in self-defense. It is thus black citizens who would be disproportionately increasingly likely to be convicted and imprisoned under the narrowed scope of self-defense sought than they would under the current broader scope of self-defense. Racist, indeed, but not in the way the racial grievance industry pretends to be the case. Two of the changes SB 636 proposes appear to my eye to be of no actual consequence, and thus can be characterized as little more than political theater. The third would have actual consequence, but only the consequence of reverting Florida’s self-defense immunity law to a previous failed version. Let’s consider each of the proposed changes in turn. To clarify, the use-of-force in self-defense is currently lawful only if the defender’s belief in the need for such force is a reasonable belief. ; an unreasonable belief in the need to use-of-force will not support a claim of self-defense. By proposing this change from “reasonable belief” to “objective belief of a reasonably cautious and prudent person in the same circumstances,” SB 636 suggests to an uninformed person that this represents some kind of substantive change. To my modestly informed eye, however, it does not. “Reasonable” in this context is a legal term of art that already includes such notions as “cautious and prudent person in the same circumstance.” Indeed, that’s precisely how an act is judged to be reasonable, or not: by inquiring if a reasonable and prudent person, with the same or similar knowledge, experience, and training, in the same or similar circumstances, would have perceived the matter as did the defendant. So, as near as I can tell as a lawyer with some expertise in use-of-force law, this proposed change in Florida law is no change at all. The outcomes under the proposed new standard would be exactly the same as the outcomes under the old existing standard because there is no substantive difference between the two standards. That said, I’ll concede that I’ve been wrong once or twice before. To account for that possibility, I would ask Senator Braynon to answer the following question: If the proposed standard is a substantive change that would drive different outcomes from the current standard, how exactly would one expect those outcomes to differ? What are examples of use-of-force that would be lawful and result in acquittal under the current standard, but would result in conviction and decades or life in prison under the proposed standard? Because if you don’t understand that, you don’t understand the proposed change at all in any meaningful sense. This is actually the third of the proposed changes listed in SB 636 as a matter of sequence, but it shares the same defects as just described above, so I’ll cover it here. The proposal itself is fairly self-explanatory on the surface: if a purported defender was the aggressor in a fight, he ought to be denied the benefit of self-defense immunity. Fair enough. And utterly meaningless as a change in policy, because it simply doesn’t represent a change in policy. At all. A purported defender who is the aggressor in a fight cannot currently qualify for self-defense immunity, because an aggressor cannot justify their use of force as lawful self-defense at all. To understand why this proposed change is pointless one must understand how self-defense immunity actually works. In effect, a self-defense immunity hearing is simply an opportunity to demonstrate to a court, pre-trial, that one’s use of force qualifies as lawful self-defense. If this can be done pre-trial, there’s no point for the expense and time of a full-blown trial, so self-defense immunity provides for extremely useful efficiency in the administration of justice. In determining whether a defendant qualifies for self-defense immunity the hearing judge simply looks at exactly the same elements of a self-defense claim as would be argued at a trial. The conditions for self-defense immunity and for self-defense at trial are identical, not different. Under current Florida law, indeed under the self-defense law of every state, a person who is the aggressor in a fight cannot justify that use of force as self-defense. It need hardly be stated that self-defense is intended to justify a defender from the use-of-force of an aggressor, not to justify the use-of-force of an aggressor against a defender. Accordingly, the physical aggressor cannot qualify for self-defense. The fact that the aggressor cannot qualify for self-defense applies both at trial and at a pre-trial self-defense immunity hearing, because both settings are conducting the same legal inquiry. Because current law provides that an aggressor cannot qualify for self-defense, it necessarily provides that the aggressor cannot qualify for self-defense immunity. Thus the proposed “change” in SB 636, that self-defense immunity not be available to an aggressor, is no change at all, it is already the case that self-defense immunity is not available to an aggressor. Again, however, perhaps I fail to understand what Senator Braynon believes he is seeking to achieve. In that case, I ask the same question as above: If the proposed standard is a substantive change that would drive different outcomes from the current standard, how exactly would one expect those outcomes to differ? What are examples of an aggressor who would qualify for self-defense immunity under the current standard, but would not qualify for self-defense immunity under the proposed standard? This would be a genuinely substantive change in Florida self-defense immunity law, and normally I’d say it’s perfectly good fodder for public policy debate. Here’s the problem: That debate has already happened, and been settled. It was only months ago that the Florida legislature changed the legal standard from what r proposes—by a preponderance of the evidence—to the current standard of by clear and convincing evidence. And the Florida legislature had good reason for making that change to a tougher burden of proof on the prosecution. Under the previous standard of a preponderance of the evidence, the granting of self-defense immunity by the Florida courts was virtually unheard of, regardless of the underlying facts of the case. The reason, one suspects, is that it was just as easy for Florida judges to push the matter up to trial rather than take the political heat that might come their way from granting immunity in a politically volatile use-of-force case. The result was the self-defense immunity was virtually never granted, and the entire immunity statute was thus pointless—the will of the legislature in passing immunity in the first place was being thwarted by the courts. Eventually, the legislature got sick of this situation, and that’s what led to them raising the burden on the prosecution to defeat a claim of self-defense immunity. Nor Senator Braynon wants to lower that burden back to the level that has already been demonstrated to render the immunity state useless. I expect that this attack by Senator Braynon on Florida’s self-defense law is primarily a matter of simple political theater, rather than any substantive effort to change the law. So long as the state’s self-defense law in general, and “Stand-Your-Ground” in particular, continues to be successfully characterized as “RACIST! !11!” by the racial grievance industrial complex, there’s political mileage to be gained by attacking that purportedly racist target. Nevertheless, we can’t assume such actions to be merely political theater, and as history continues to remind us, law-abiding citizens must remain eternally vigilant in protecting our natural rights of self-defense against Progressive fascist encroachment. Good luck, Florida. Do the right thing. You really have to credit Democrats, they NEVER take their eye off the ball. Any legislative or electoral defeat is nothing more than a reason to reword and move forward. They do this on every issue, whether it’s gun confiscation (their real aim) or infanticide (see Mario Cuomo, etal). I wonder if the proposed law would eliminate the possibility of regaining innocence? It eliminates self-defense immunity for an aggressor, no exceptions. So if someone was ever an aggressor, even if they withdrew and communicated their withdrawal, they would still lose self-defense immunity? Help me out here if you have an opinion. Thanks.